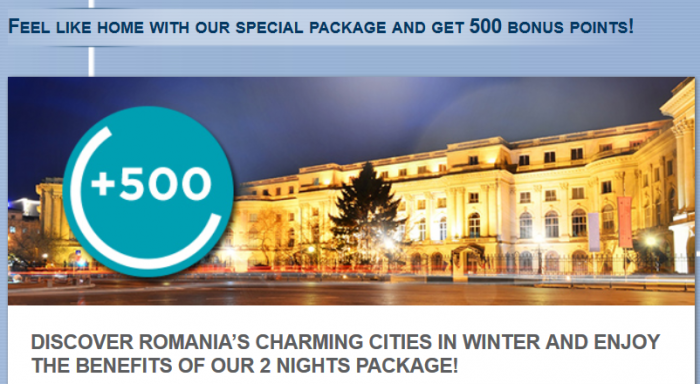 Le Club Accorhotels has launched an offer for stays of two nights or longer in Romania between December 19 – February 28, 2015. You must book a specific “Home Away From Home” package to get the bonus points + some other extras. Could work for those that plan to stay in Romania this winter. Remember that 500 bonus points are worth 10 euros when redeemed for vouchers. 1. General Le Club Accorhotels terms and conditions apply to “Home Away From Home package” offer (including accommodation in standard room, 1 breakfast per person per day, 1 large bottle of water per stay, 1 welcome drink per person per stay, 1 pair of slippers per person per stay, 1 shaving kit and 1 dental kit per stay and free WiFi). 2. This offer is valid for any “Home Away From Home package” stay with minimum 2 nights done between 19th December 2014 and 28th February 2015 in one of the participating hotels, and booked minimum 3 days before arrival between 1st November 2014 and 28th February 2015. 3. This offer entitles Le Club Accorhotels Loyalty members, regardless of their status, to benefit from earning 500 bonus points in one of the participating hotels in Romania. 4. You must book your stay ahead of time on-line to benefit from this offer (www.accorhotels.com or brands.com) or via our Accor call centers. 7. Reservations that include several rooms covered by the same member during his or her stay are only counted as one stay. 8. This offer may not be combined with other current offers or advantages and does not apply to groups. 10. This offer can be used only twice per member during its validity period.